Pot stocks are changing fortunes in 2019! If you’re invested, you’re riding high. The U.S. side of the index has jumped 29.9%. Meanwhile, those hefty Canadian market leaders have surged 44%. Of course, individual companies have done even better. Especially as the industry continues to gain mainstream attraction. Last week, we covered HEXO Corp. (NYSE: HEXO), which began trading on the New York Stock Exchange (NYSE). And this week, another major player is hoping to make its debut on an American exchange. CannTrust Holdings (OTC: CNTTF) is a Canadian licensed producer of medical cannabis products, including oils, capsules, dry herbs and vaporizers. Personally, it’s one of my favorites because of its potential to be in every market. It’s already a major stakeholder in Cannabis Coffee & Tea Pod Company, the producer of the U.S.-patented cannabis-infused beverage brand BrewBudz. And it owns Canadian adult-use labels Xscape, liiv and Synr.g. Earlier this month, CannTrust applied to list on the NYSE. This would add its name to the roster of other high-profile Canadian cannabis producers that have been listed on U.S. exchanges over the past year. And the chances are extremely good it’ll be approved. CannTrust had impressive revenue growth in its third quarter. Sales more than doubled year over year to $12.6 million. And its active patient base jumped 61% to more than 50,000. CannTrust’s goal is to double its production capacity from 50,000 kilograms to 100,0000 kilograms per year, which will require a major expansion of its current production facilities. The cannabis industry is still in the early years of high spend and high growth. That means earnings are often negative. This takes the standard – and popular – price-to-earnings (P/E) ratio valuation metric off the table. So my team and I have been looking at price-to-sales (P/S) ratios. We found that the industry average is pretty high, at 66.6. The Las Vegas-based hemp oil producer Vitalibis (OTC: VCBD) had a shockingly high P/S of 1,692! Luckily, that was the only cannabis company with a P/S that egregious. The second-highest P/S ratio belonged to GW Pharmaceuticals (Nasdaq: GWPH), the first company to receive FDA approval for a cannabis-based treatment. But you can see that there are a lot of familiar names in that top 10, including Cronos Group (Nasdaq: CRON), Canopy Growth Corp. (NYSE: CGC) and the newly listed HEXO Corp.
Not only are those ratios above the industry average of 66.6… but they’re also above 100. So they’re very expensive compared with sales. 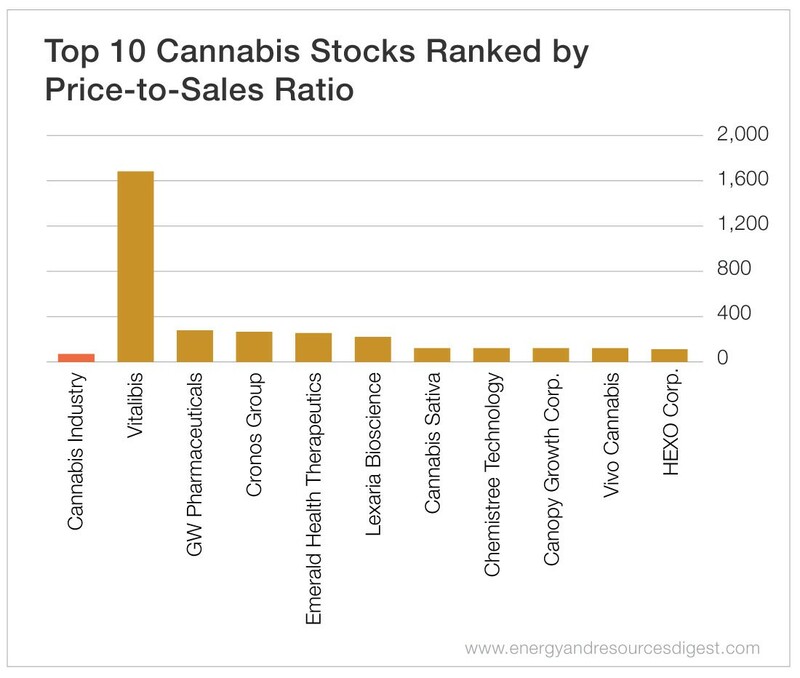 The bright side is most of the top 10 pot stocks had a P/S ratio below 100. I’ve said it many times before: There is no industry changing as rapidly or as unevenly as cannabis. Each week, there’s an ever-growing number of storylines. So this week I’m introducing my list of the top five pot stocks investors should watch. This is another huge potential winner in the annabidiol-derived hemp industry, as well as the burgeoning commercial hemp industry. The company’s joint venture with Emerald Health Therapeutics (OTC: EMTHF), Pure Sunfarms, has also been cleared to expand to 1.1 million square feet. Shares are up 63% in 2019. But they’re still well below their peak of $7.71. 2) Medicine Man Technologies (OTC: MDCL): Shares of the cannabis consulting and services company haven’t been slouching in 2019. They’ve gained more than 46% already. The company acquired Medpharm Holdings, giving it access to extraction and retail sales. Medpharm’s two big brands are Aliviar and become. So it’s making the transition from consulting to dipping its toes into the international cannabis market. 3) MedMen Enterprises (OTC: MMNFF): Shares have lagged the gains of the North American Marijuana Index. But the company recently announced preliminary second quarter results. Revenue surged 40% to $29.9 million. Meanwhile, pro forma revenue (pending acquisitions) came in at $49.5 million. The company’s eight dispensaries in California were beasts. Revenue grew 27% sequentially to $23.7 million. CEO Adam Beirman said MedMen plans to open 16 new dispensaries this year, with 12 of those in Florida. 4) Planet 13 Holdings (OTC: PLNHF): The dispensary operator is another one to watch. Shares have gained almost 40% this month, nearly doubling the stock’s value. The consensus price target for Planet 13 is $3.65. That’s a 140% increase from its current level. 5) Origin House (OTC: ORHOF): Formerly known as CannaRoyalty Corp., Origin House is a private equity firm specializing in cannabis investments. It invested globally in 2018 but built a stronghold in California. It was the second-best performer on the OTCQX last year, gaining 58.9%. Shares have already surged more than 40% in January. But I think they need to be on everyone’s radar right now to prepare for what’s on the horizon. 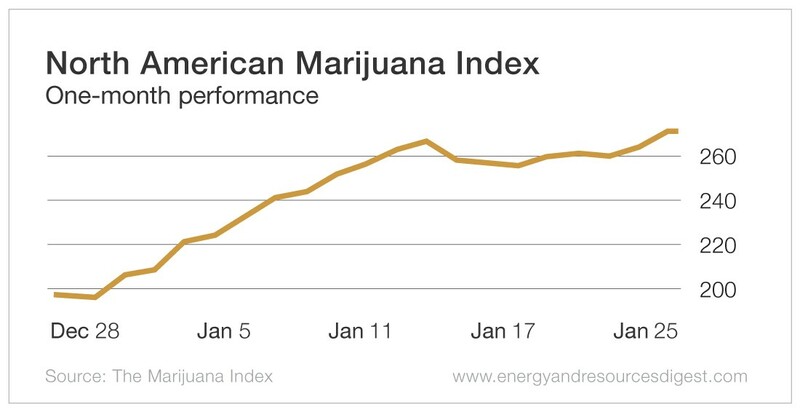 As I said at the beginning of this week’s column, pot stocks are changing fortunes in 2019. They ended 2018 on a sour note, despite all the major milestones achieved. But I believe what we’re seeing so far in 2019 is just the beginning. 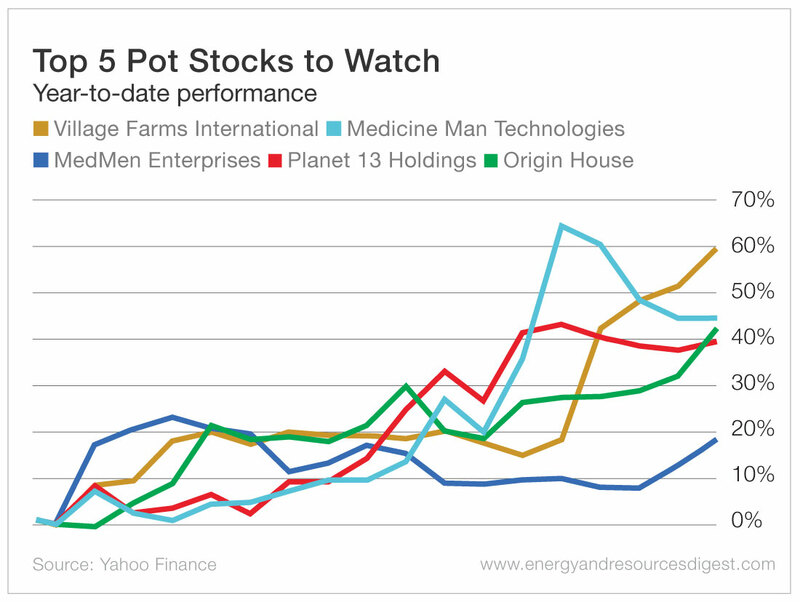 The post Top 5 Pot Stocks to Watch appeared first on Energy and Resources Digest.